Singers and Speakers Will Sound Praises of Boulevard This Evening. Celebration To-Night Will Inaugurate Campaign for Great Undertaking. 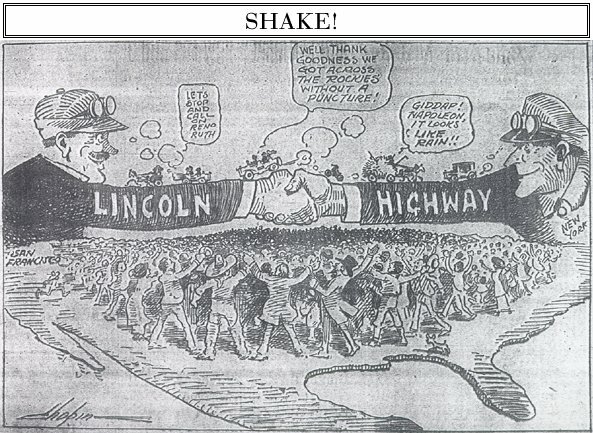 The Lincoln Highway, which promises to be a lasting monument to the automobile industry, and one of the greatest developments ever made in this country, will be officialy dedicated tonight by every city, town and hamelet between New York and San Francisco. The widespread enthusiasm with which the highway project has been received throughout the country is the best indication of its ultimate success and the dedication celebrations held throughout the United States to-day will officially start the campaign for construction of the highway. That San Francisco should take an important part in the dedication of the proposed highway is in keeping with the position which this city will occupy as the western terminal of the road. In order to show the city's appreciation for its selection as the western end of the highway a big celebration will be held to-night at the Valencia Theatre. Men prominent in commercial and civic organizations will take an active part in the dedication and will make speeches on the wonderful possibilities of the highway. Elaborate plans have been made by the members of the Motor Car Dealers' Association, under whose auspices the celebration will be held, for giving the highway project a big boost to create interest in the road among motorists and lovers of good roads throughout this section of the state. The men who are striving to make the national highway a practical reality will assemble at the mass meeting. Gifted speakers will tell of Abraham Lincoln, of the struggles to connect civilization with the ever diminishing wilderness and of the time in the not far distant future when all the world may come to California over the longest and finest highway in the world. A splendid concert by the Municipal band and solos by well-known singers will divide the time with the speakers. "The committee in charge of the celebration has thrown open the doors to every resident of the city. We want everybody that can be present to come," said E. P. Brinegar, state counsel for the Highway Association. "The celebration is in honor of the greatest highway project that was ever undertaken and San Francisco occupies the most important position on the highway as the western terminal. We want to start the project with a boom." The programme is to be by no means limited to oratory. The committee has been promised the presence of Leoncavallo, the great composer who is now visiting the city, author of "Pagliacci" and "Zingari," and the Municipal Band will render, as a special feature, Leoncavallo's "The United States Forever." Beatriz Michelena, the prima donna who established a well-remembered success in "The Tik-Tok Man," and Mrs. Roy Lee will both contribute musical numbers. The women of San Francisco who are interested in progressive movements will be well represented. A delegation from the San Francisco center of the California Civic League will participate and practically every commercial and promotion organization in the city and down the peninsula will be represented by its officers. The celebration has been arranged by President Marsh of the Dealers' Association, assisted by William Hughson and Frank Carroll. Originally published in the San Francisco Examiner, Friday, October 31, 1913.